Autoimmune Diseases occur when the immune system mistakes some part of the body as a pathogen and starts to attack itself. We can help you manage and put them into remission. 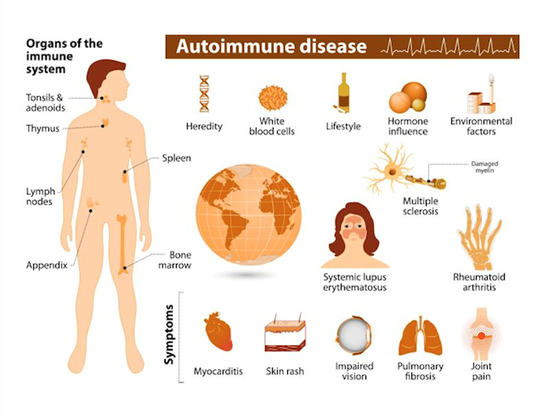 Autoimmune diseases are the third largest cause of morbidity / mortality in the industrialised world; surpassed only by cancer and heart disease. Furthermore, hundreds of thousands of the UK population are living with autoimmune disease symptoms, and have their quality of every day life severely impaired. We have a wealth of experience across our practitioners in working with many different autoimmune diseases; helping people to manage their conditions, and in some cases, to live a symptom-free life. Once an autoimmune process has been activated, any of the vital organs, glands and tissue can be attacked. As they become damaged, their function reduces creating an array of symptoms. Milder symptoms might include chronic joint inflammation (Arthritis) and hypothyroidism (Hashimotos) whilst more serious symptoms can include liver failure from autoimmune hepatitis. There is often a genetic predisposition, which becomes activated by environmental influences. The health of the gut also plays a vital role. As the lining becomes damaged, holes are created that allow undigested food particles and toxins into the blood. 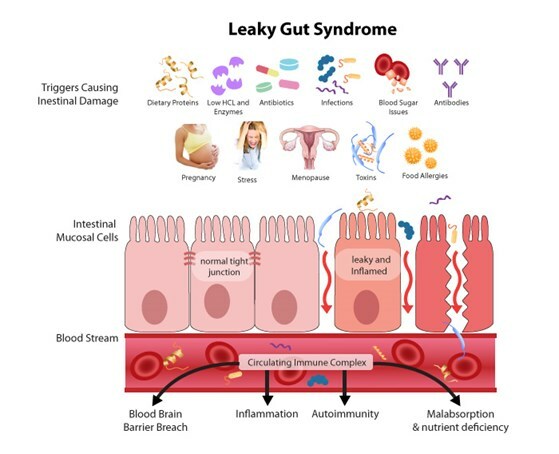 This process is known as leaky gut and not only creates a chain reaction of chronic inflammation, but also increases the toxic load on the liver and detoxification pathways. Another common and overlooked cause is undiagnosed bacterial and viral infections. Without understanding the root cause of the problem, conventional medicine has little to offer AID sufferers. At the London Clinic of Nutrition, we use a different approach – based on the latest research in functional medicine. Some of the areas we pay particular attention to are gut health (healing the leaky gut), toxicity (such as heavy metals) and identifying any bacterial and viral infections present. It is also important to identify undiagnosed gluten sensitivity. All of these causes can be identified using accurate state of the art testing. An autoimmune disease diet will normally consist of the avoidance of foods that trigger symptoms. A low lectin diet is often a good approach and is often part of the rationale for the autoimmune paleo diet. Personalised nutrition is important and can be discussed in more detail at a consultation. The whole experience with London Clinic of Nutrition and Oliver Barnett has been totally positive, and I can not recommend highly enough. Quite simply, the whole experience has turned my life around. The London Clinic of Nutrition is a multi-disciplined health practice offering personalised nutritional medicine and naturopathy using the functional medicine approach. London Clinic of Nutrition ©. All Rights Reserved. Call to book your FREE 15 min consultation or simply fill your details in the form below.